The course of treatment for this disorder depends on the type and degree of stenosis. Mild stenosis may require no intervention at all. More severe cases of valvular stenosis may be treated without surgery by Balloon Valvuloplasty as part of a cardiac catheterization. In this procedure, a catheter with a balloon at the end is inserted from a vein in the leg into the right ventricle. The balloon is then positioned at the point of narrowing in the pulmonary valve and the balloon is inflated on the catheter. As the balloon increases in size, it stretches the narrowed area and widens it. Then the balloon is deflated and the catheter is withdrawn. Occasionally, surgical repair of Pulmonary Stenosis may be required. If the obstruction is due to thickened muscle tissue below the pulmonary valve (subvalvar stenosis), it may be removed to widen the opening (see illustration). If the pulmonary valve is too small for surgical or balloon valvuloplasty, it may be widened by the insertion of a patch made of homograft material (human tissue that has been cold-stored). If a patch is inserted, it may be used to widen the pulmonary artery from the valve upward. 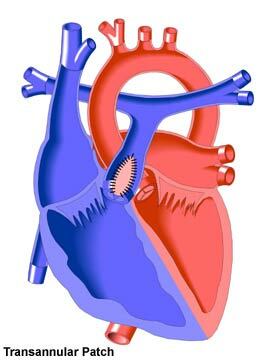 However, if there is also a need to widen the outflow tract of the right ventricle, a transannular patch may be required. This patch covers part of the wall of the right ventricle as well as widening the pulmonary artery and pulmonary valve. In all cases, care is taken to preserve the pulmonary valve and ensure its proper functioning. However any surgical approach that requires a transannular patch will relieve the stenosis, but result in valve leakiness (insuffiency). Patients who have a balloon valvuloplasty in the catheterization laboratory often go home the same day. Recovery from the repair operation for Pulmonary Stenosis is usually uncomplicated, requiring an average hospital stay of from 3 to 5 days.